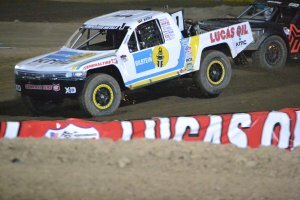 Lucas Oil Off Road Racing Series LOORRS, presented by GEICO, got their 2019 racing season officially underway Saturday night under the lights at Glen Helen Raceway. Titled the General Tire SoCal Shootout, presented by K&N Filters, the event had 147 entries signed up to battle on the one-mile track and witnessed by those in packed grandstands. Starting the evening off was the Pro 2 field with 14 trucks signed up. New this year is the Pro 2 M engine which only Daely Pentico and Cory Winner had installed. The new M engine is an attempt to providing a more competitive class with reduced engine costs. The M engine is a 410 cubic inch V8 and has been in use for a couple of years in the Midwest series and has proven to be reliable. The engine does produce less power than traditional Pro 2 engines but the cost along with less wear on the drive train makes the engine attractive for the future of the series. Because of the power difference those two trucks equipped with the M engine were spotted a 20-second lead on the standing start. Once racing Cory Winner took the early lead. Winner would lead most of the race but stalled late in the race and Jerett Brooks (77) was able to take the checkered. Brian Deegan crossed over second and RJ Anderson was third. Daely Pentico was fourth. Pro 4 racing is always exciting and the season opener didn’t let the fans down. The seven truck field saw Doug Mittag take the early lead. Kyle LeDuc was second and defending champion RJ Anderson third. Early on LeDuc tried to cut inside Mittag but spun out dropping him to the back of the pack. He would regain a couple of spots before spinning out again. Mid race Anderson had some handling problems dropping his threat on Mittag. With only two laps to go Mittag made an error that put him against the wall which gave Carlson the lead. His lead was short lived as LeDuc gut inside to steal the lead going into the final lap. Carlson would also see RJ Anderson and Greg Adler drive past. After spinning out twice Kyle LeDuc (99) took top spot on the podium with Anderson second and Adler third. 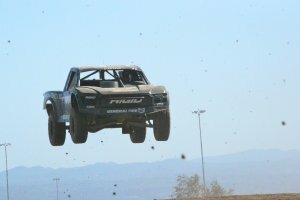 Defending class champion Ryan Beat (1) continued his winning ways in the Pro Lite class. The class had 17 entries with Brock Heger pressing Beat early on but Christopher Polvoorde soon took the second spot from Heger and Ronnie Anderson made his way into third. These three would finish the race in that order. Chris Nunes (2) set quick time in the Pro Buggy qualifying session then cam back to take a wire-to-wire victory over the 13 car field. Eliott Watson would finish second and Trey Gibbs third. There were 22 Mod Kart entries with defending champion Brody Eggleston, Mason Prater and Bronson Chiaramonte providing most of the up front action. Early on Eggleston sat back and let Chiaramonte and Prater dice for the lead then with two laps to go Eggleston (514) saw his opening and drive straight to the checkers. Bronson Chiaramonte finished second and Braden Chiaramonte crossed over third. Junior Kart 2 winner was Broedy Grahm (466) with Braydon Beatty second and Cade Martin third. 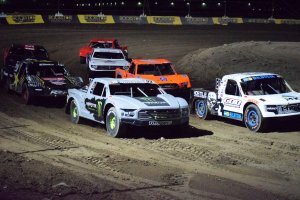 New to the LOORRS professional events for 2019 are the RZR 170 field consisting of 22 entries. Ryder Vanbeekum (164) would take the win with RJ Siewers second and George Llamosas third.